Can Senator Samdady’s ‘divine Mandate’ Be Stolen? As a scholar of religious studies, I have discovered that life looks very disappointing without a purpose. There is a cycle which makes us and sometime too brakes us if we are not careful. Life is not what we think it is. The outer life is a camouflage of something higher than the ordinary. God by nature is ABSOLUTE and anything that is attached or is associated with Him, assumes the same absolute nature. This philosophical fact is attested to by both orthodox and conventional theologians. We start having purpose in life as a child, as youngster pursuing higher education, a high paying job, as working professional, as a politician etc .Whatever be your purpose in life, you need to understand that you are highly privileged to be born as a human being with body, soul and spirit. Yes animals do not have spiritual awakening so to drop your purpose in life is to fail in all compass of the truth. Few people know why they were born into the physical system of reality, others do not know and they pass through life being punished. In accordance with the teachings of International Society for Krishna Consciousness which is an offshoot of Hinduism, things do not happen by chance. As a matter of fact, in Oriental cosmology, Krishna is quoted in the Bhagavad Gita to have summarized the purpose of life thus, “Abandon all varieties of religion and just surrender unto me. I shall deliver you from all sinful reactions. Do not fear” Bhagavad Gita 16:18. Following the above, the purpose of life is for one to surrender to the lord in total devotion, in this kind of total devotion ones destiny is uncovered. The destiny of someone who has understood the true purpose of life is in the hands of the lord. When the person surrenders to the divine in this connection, any assignment given to him becomes divine mandate. The great question which we may attempt to answer is whether such mandate or directive could be stolen by anyone? Though divine mandate is associated with God and is all about a person on a divine mission. The trajectory of this mission is absolutely divine and the history of divine mandate is traced to an old political idea from Ancient China and it implies that God or celestial being appoints the ruler of a land or country. The “chosen one” would be the embodiment of God’s will. In the Quran 65:2-3 Allah says, “And He provides for him from (sources) he never could imagine. And if anyone puts his trust in Allah, sufficient is (Allah) for him. For Allah will surely accomplish his purpose; verily, for all things has Allah appointed a due proportion.” Here Allah is saying that anyone who puts his trust in him shall sufficiently find the accomplishment of his purpose or mandate. Yes, nothing could be more embarrassing than to see what you are too sure of and what you regard as the truth which is hitherto associated with God being messed up by someone who does not understand the meeting and parting point of same in the name of politics. The joy of seeing that justice is done comes from within and not without. In as much as the Moon and the Sun together with the truth cannot hide for too long, Divine Mandate must speak hence the vision of Senator Samdaddy Anyanwu is for appointed time and now is the time for its fulfilment. Let me accentuate here that the destiny of Divine Mandate is the dream and hope of Imolites. When the distinguished Senator Samdaddy expressed his intention to run for the position of the state chief executive, little did he know that he was carrying the destiny of Imo state under the auspices of Divine Mandate. I am here speaking as a political prophet let my readers be properly guided. 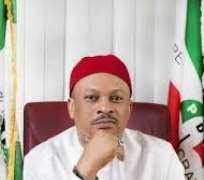 The distinguished Senator Samdaddy Anyanwu is a man who believes in the true philosophy of life. He knows that if one lights a lamp for someone, it will also brighten the person’s path hence in 2015, he played his part in no small measure to advance the guber ambition of the then flag bearer of PDP, unfortunately, Gov. Rochas was declared the winner. As a silent operator, he has learnt a great lesion from water hence loud splashes the brook but the oceans dept are calm. In the words of the great sage, “Thousands of candles can be lit from a single candle, and the life of the candle will not be shortened. Happiness never decreases by being shared.” Just as millions of candles lit from a single one will not shorten the lifespan of the candle, so also no amount of legal battle and undue manipulation subtly induced can reduce the mission and intentions of Divine Mandate to naught. As a man who is playing politics with morality, Senator Samdaddy knows too well that what God has ordained is a miracle and no one is big enough to constitute himself an obstacle when God is willing to perform a miracle. After the primaries held by the Peoples Democratic Party (PDP), prior to the primaries, the Senator challenged Rt. Hon. Emeka Ihedioha to a serious political battle and something happened at the primaries which was not too clear to the Senator that brought about the victory of Rt. Hon. Emeka Ihedioha. As a civilized political general, Senator Anyanwu congratulated Rt. Hon Ihidioha in the spirit of love and sportsmanship for the victory even though he knew what happened. I have come to the realization of the common fact that one moment can change a day, one day can change a life time and one changed life can change things around the world. As a religious man, the distinguished Senator never wanted to have a burden of injustice done to him on his mind hence he decided to seek justice in the court of law. He is not shaken by blame because injustice to one is injustice to all. The matter in the court is to be decided by the jurist and I am not going to talk about that but suffice it that those who are blaming the Senator for seeking justice in the court of law, should bear in mind that God works in so many ways and Divine Mandate being the acronym where the campaign organization of the Senator is operating from, has the approval of God and our God cannot afford to put his people to shame. Can Divine Mandate of Senator Samdaddy be stolen? My answer is simple no one can steal what God has approved not even Satan himself. Senator Samdaddy is fighting for his right and should not be persecuted for doing the right thing.